Even the Capitol police aren't quite used to Tester, who looks a bit different from most senators with his flat top haircut and fingers missing on his left hand. They asked him to empty his pockets on the security belt just outside the Capitol. "Just like at the airport, you put it all through?" Tester asked. He's not acting the part either. Two days after being elected senator from Montana, the Great Falls Tribune reports he went shopping at Sam's Club, where he bought a 55-gallon drum of oil. Timothy Egan of the New York Times writes that Tester "will most likely be the only person in the world’s most exclusive club who knows how to butcher a cow or grease a combine." 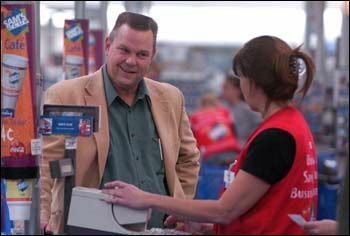 I first took note of Tester in June of last year, when I wrote that he was going around the state in a big rig that reads, "You're behind the right guy" on the back. JT is awesome (I am close with some of his campaign staff). He is truly in it for the right reasons and ousted a real bad Republican. He will make a great Senator. Anyone else notice he looks an awful lot like another recently elected down-home Democrat, Harold Brode?? There is a great set of photos from his campaign that Kos is using to get DEM folks up to speed and into the 21st century (I think I read this on DE Liberal) but the most fum part of Tester's successful bid effort was that he toured Montana with a fellow native and PearlJam musician. Now that is touring in style.